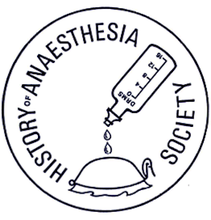 The History of Anaesthesia Society is respectful of the privacy of all visitors to its website. In common with most websites, we utilise cookies to gather information on site activity. A Cookie is essentially a small piece of information that is sent from our website and stored on your computer’s browser. This identifies the browser and allows retrieval of information including your Internet Protocol (IP) address, browser type and language, Internet service provider (ISP), referring and exit pages, operating system, date/time stamp, and clickstream data. Your browser only permits our website to access the cookies it has set, not those set by other websites. We use this information to understand and analyse trends, administer the site, learn about user behaviour and gather demographic information about our user base as a whole. Over time this will allow us to modify content and improve the experience for our visitors. Since Internet Protocol (IP) addresses or similar identifiers are considered personal information by EU law, we treat these as such. We do not disclose any information to third parties. A website may only set a cookie to a browser if the browser's preferences allow it. It is possible to disable cookies or remove those already on your computer. Refer to the instructions for your file management software. Disabling/removing cookies will not affect the functionality of the History of Anaesthesia Society website, but may prevent access to certain areas or features of other websites, including some of those to which we offer links. Further information on the law concerning cookies as well as a guide to deleting or controlling them, can be found at the website www.AboutCookies.org.